The Crown King General Store where the Toll Station payphone was until the late 70's. Arizona was one of the last remaining states to have Toll Stations up until in the late 70's. They were primarily handled by the Phoenix cordboard although some of them had Toll Centers physically closer. In a sense Toll Stations or "ring downs" were the original party lines, but quite unlike what party lines had evolved to by the 1970's. Modern party lines have individual 7 digit numbers, using a switch to connect the call. But ring downs need an operator. Ring downs provide telephone service to very remote areas that have no reason for a switch and that required a small 4-wire toll line with repeaters. Toll Stations or "ring downs" basically were localities that had a single 4-wire toll line going directly from a toll center to the locality, then disbursed to stations in the area on 2-wire "party lines." No local central office. They had from 1 to 8 stations and were numbered by name, e.g. : Valle (Grand Canyon) #1, #2, etc. or Organ Pipe #1, #2, etc. They usually had at least one pay station, usually at the General Store (sounds quaint these days). Very often they may have had only one station, which was the pay station itself. 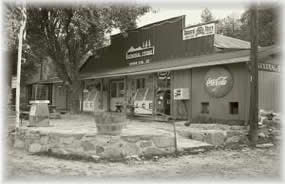 The General Store at Crown King, Arizona had a pay station that was one of the last Toll Stations in the Arizona and the US. Toll Stations served remote areas and people from the community, ranchers, forest service, would place calls when near by or pick up messages left for them by the Toll Center Operator. They were the last vestige of the old "number please?" era.